After reaching the pinnacle of the daily fantasy sports universe, FanDuel is now making its mark in the sports betting space with the much-anticipated launch of the FanDuel Sportsbook in East Rutherford, N.J. Owned by European bookmaking giant Betfair, FanDuel has overcome some initial complaints over its odds to become one of the most popular sportsbooks in New Jersey. And best of all, bettors can get started for as little as a $10 minimum despoit, which FanDuel Sportsbook will match in wagering dollars. Players have a variety of ways in which they can load their accounts, including via checking account, credit or debit card, PayPal, FanDuel prepaid card, eCheck, online bank or wire transfers, cage deposit, or PayNearMe. And Fanduel Sportsbook promptly pays out using a number of methods, including automated clearing house (ACH), check, FanDuel prepaid card, or via the Golden Nugget Atlantic City cage. Prepaid card withdrawals are processed in three days, and check withdrawals in five days. The FanDuel Sportsbook is located at Meadowlands Racing and Entertainment on Racetrack Drive in East Rutherford, New Jersey, located next to MetLife Stadium. However, if you wish to cash out any winnings in person, you'll need to go to the Golden Nugget Atlantic City Casino cage located at Huron & Brigantine Blvd., in Atlantic City. Unlike the majority of sportsbooks that have already established themselves in New Jersey, Fanduel offers a limited slate of sports to bet on; you won't find many secondary sports on here, and you can't wager on eSports. And while live betting is offered, bettors don't yet have the option of "cashing out" bets while an event is going on, putting FanDuel Sportsbook in the minority there. 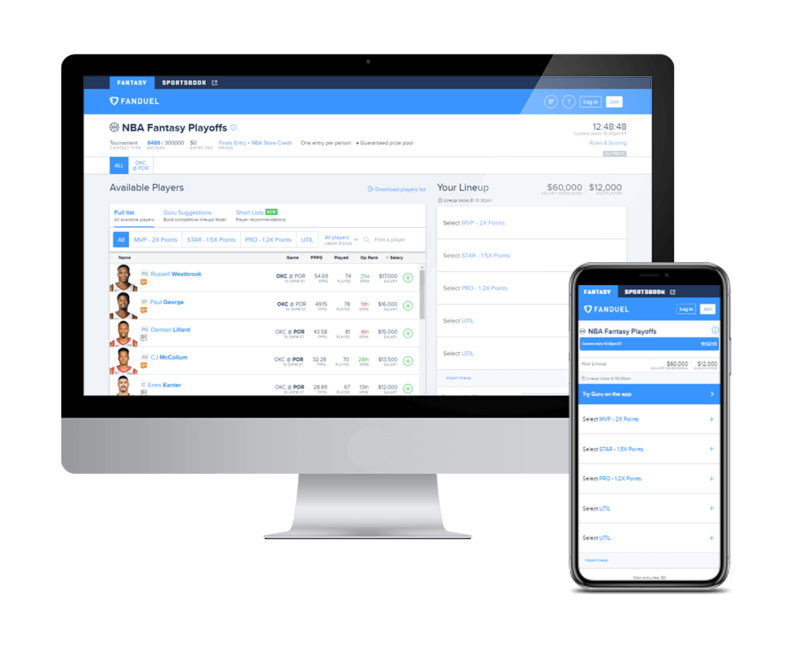 The mobile interface is one of the strongest aspects of FanDuel Sportsbook's offering. The trademark FanDuel blue is eye-catching, while the interface itself is straightforward and easy to navigate thanks toa variety of quick tabs that take bettors to various sports. Less is more here, as the FanDuel Sportsbook experience is actually made easier with fewer sports to slosh through. Customer service has always been one of FanDuel's strong suits – and the sportsbook arm is no exception here. You can contact a live agent 24 hours a day, seven days a week via live chat, or through social media. Customers can also reach out via email or telephone should they choose to use those methods instead. In addition to using SSL to protect users' information through encryption – as is the industry standard – a security review is triggered whenever any suspicious activity is reported on a user's account. And while users aren't required to produce photo ID upon sign-up, they'll need something with their picture on it if anything suspicious does take place. While minimum and maximum bet limits vary depending on the sport or event, FanDuel states that a player cannot win more than $1,000,000 in a single day. Any winnings over and above that amount for that day are forfeited.